ClickHouse datasource plugin provides a support for ClickHouse as a backend database. Copy files to your Grafana plugin directory. 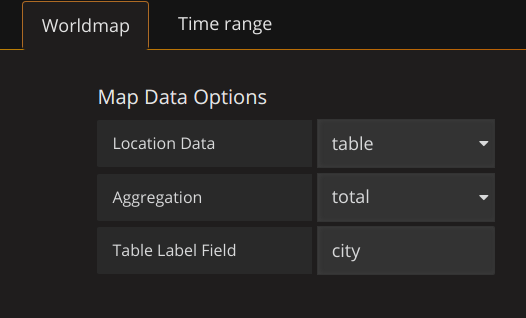 Restart Grafana, check datasources list at http://your.grafana.instance/datasources/new, choose ClickHouse option. There is a small feature - ClickHouse treats HTTP Basic Authentication credentials as a database user and will try to run queries using its name. 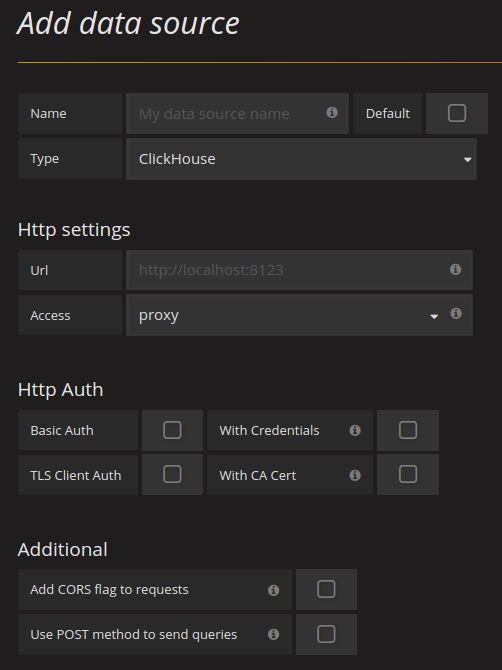 Easily setup HTTPS access to ClickHouse as shown here to provide secure access. 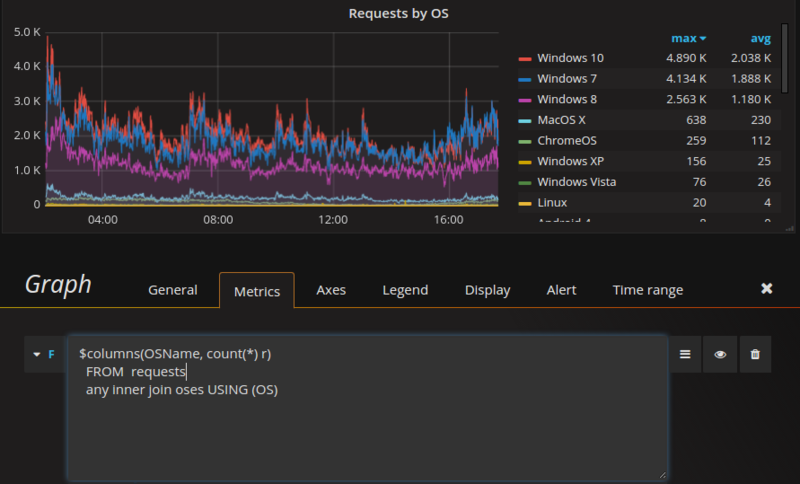 Limit concurrency and execution time for requests from Grafana as shown here to prevent ClickHouse overloading from Grafana. 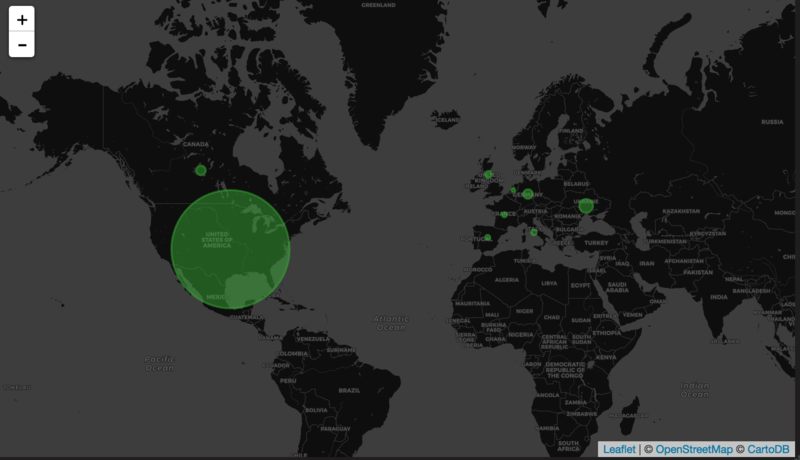 Protection against request bursts for dashboards with numerous graphs. CHProxy allows to queue requests and execute them sequentially. To learn more - read about params max_queue_size and max_queue_time at CHProxy page. Response caching for the most frequent queries as shown here. Caching will protect ClickHouse from excessive refreshes and will be optimal option for popular dashboards. Column:DateTime (DateTime) or Column:TimeStamp (UInt32). Raw Editor allows to type queries, get info about functions and macroses, format queries as Clickhouse do. Under the Editor you can find a raw query (all macros and functions have already been replaced) which will be sent directly to ClickHouse. $from - replaced with timestamp/1000 value of selected "Time Range:From"
$to - replaced with timestamp/1000 value of selected "Time Range:To"
$timeSeries - replaced with special ClickHouse construction to convert results as time-series data. Use it as "SELECT $timeSeries...". $unescape - unescapes variable value by removing single quotes. Used for multiple-value string variables: "SELECT $unescape($column) FROM requests WHERE $unescape($column) = 5"
$adhoc - replaced with a rendered ad-hoc filter expression, or "1" if no ad-hoc filters exist. Since ad-hoc applies automatically only to outer queries the macros can be used for filtering in inner queries. Functions are just templates of SQL queries and you can check the final query at Raw SQL Editor mode. If some additional complexity is needed - just copy raw sql into Raw Editor and make according changes. Remember that macros are still available to use. $rate(cols...) - converts query results as "change rate per interval"
To create "Top 5" diagram we will need two queries: one for 'Top 5' rows and one for 'Other' row. There are no any tricks in displaying time-series data. To print summary data, omit time column, and format the result as "Table". If there is an Ad-hoc variable, plugin will fetch all columns of all tables of all databases (except system database) as tags. So in dropdown menu will be options like database.table.column. If the default database is specified, it will only fetch tables and columns from that database, and the dropdown menu will have option like table.column. If there are ENUM columns, plugin will fetch their options and use them as tag values. Plugin will apply Ad-hoc filters to all queries on the dashboard if their settings $database and $table are the same as Ad-hoc's database.table. If the ad-hoc filter doesn't specify table, it will apply to all queries regardless of the table. This is useful if the dashboard contains queries to multiple different tables. That should help to control data fetching by ad-hoc queries. To use time range dependent macros like $from and $to in your query the refresh mode of the template variable needs to be set to On Time Range Change. 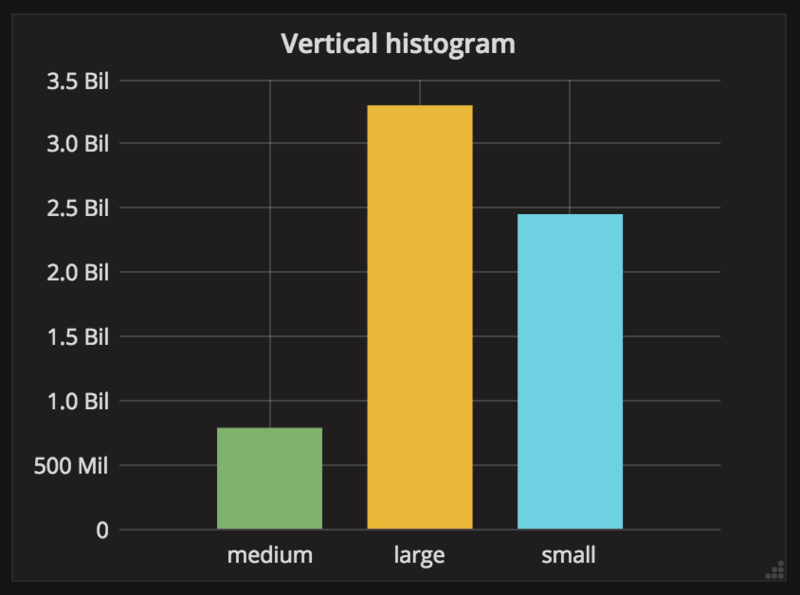 Plugin extrapolates last datapoint if timerange is last N to avoid displaying of constantly decreasing graphs when timestamp in table is rounded to minute or bigger. If it so then in 99% cases last datapoint will be much less than previous one, because last minute is not finished yet. That's why plugin checks prev datapoints and tries to predict last datapoint value just as it was already written into db. Alerts feature requires changes in Grafana's backend, which can't be extended for now. Grafana's maintainers are working on this feature. We know that code quality needs a tons of improvements and unit-tests. We will continue working on this. If you have any idea for an improvement or found a bug do not hesitate to open an issue or submit a pull request. We will appreciate any help from the community which will make working with such amazing products as ClickHouse and Grafana more convenient. MIT License, please see LICENSE for details.